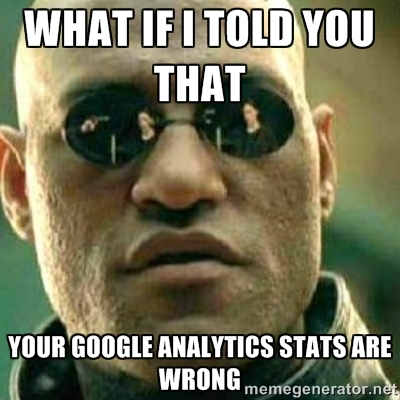 Stop Believing Data You See in Your Google Analytics: Here is Why? 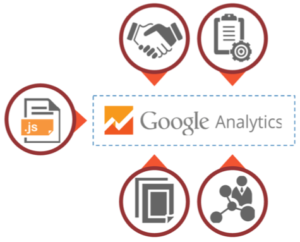 We all use Google Analytics everyday to measure our marketing campaign success. But most of us provide wrong stats (sometimes) to managers or clients because we believe analytics stats are correct. Think again? Unfortunately there are a lot of issues with the data you come by in your Google Analytics reports. Below are some highlighted issues that you must know and the solutions to avoid those mistakes. When a visitor lands on your website Google Analytics keep the track of the channel/source it comes through. But in some cases the referrer data is not trackable by Google Analytics. In that case the visitor is treated as a direct visitor in GA.
Tagging your marketing campaigns such as display/banner advertising, affiliate ads, email campaigns etc is really important if you are not tagging your URL’s while running these campaigns then most of the traffic from these sources will be treated as direct traffic. Traffic from links within word, excel or PDF documents are also treated as direct traffic. To date mobile applications don’t send any referrer to Google Analytics so these visits also show up as direct traffic. Some time people send your website links to their friends on Skype or Gtalk, hangouts. Traffic from these platforms is also treated as direct. Some websites are on https and they don’t send referrer data to http websites. So if your website is having http pages then traffic coming from https pages will be treated as direct traffic in GA. You can read a detailed post on this here. The best way to deal with direct traffic is to use campaign tagging feature of Google Analytics. Always tag your URL’s while running email campaigns, display ads, affiliate ads. Tag your links in PDF, Word or Excel documents and links in mobile applications too. Note: Don’t ignore the power of campaign tagging in Google Analytics. You can get the reports about your tagged campaigns by going to Acquisition > Campaigns. If you arent tagging URL’s then start using it now so that you can get right data in your reports. Not always but wrong code GA code installation seems to be a another reason. If GA code is missing on some of your pages (intentionally or unintentionally) then as a result you wont see sufficient data in Analytics. A page without code means no data for that specific page. So make sure that you have code installed on every single page that you want to track in your Analytics dashboard. You can use Screaming Frog or Google Analytics Debugger to analyse if the code is properly installed on every page of your website or not. Putting Google Analytics code before the closing body tag </body>. Mostly developers put the code before the body closing tag because they are afraid that these tags will slow down the loading speed but it doesn’t! If you are placing your code before </body> then you are missing those visitors who quickly click through the links on your webpage before Analytics code executes. 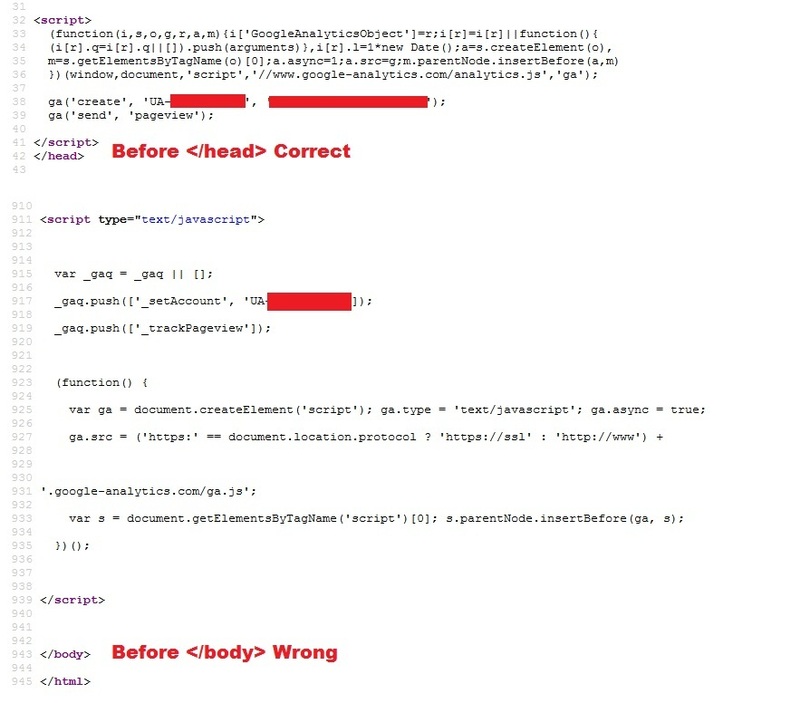 So always make sure that tracking code is placed before the </head> tag so that it can execute as soon as visitors land on your website. Having more than one Analytics code on your pages can affect your dashboard data. I had a chance to work with some clients where i saw 1% bounce rate and the other one is having 0.12% bounce rate. Confused? It took me a while to figure out that there were 2 different Analytics code installed on the same page. If two different codes execute on same page then it means there is no bounce rate and Avg. visit duration is wrong too. If you want to see correct data then make sure you are not having more than one code on a single webpage. If you have multiple links to a landing page on a single web page then Google Analytics is not able to differentiate it. For example if you have your contact us page linked from top menu and the footer too, In-Page Analytics is only going to report (X %) percentage of clicks for both. Because it cannot separate the number of clicks goes to a landing page linked from a single page but at different places. Google Analytics cannot report click information in In-page Analytics when redirects are used between pages. The solution of these issues is really easy. 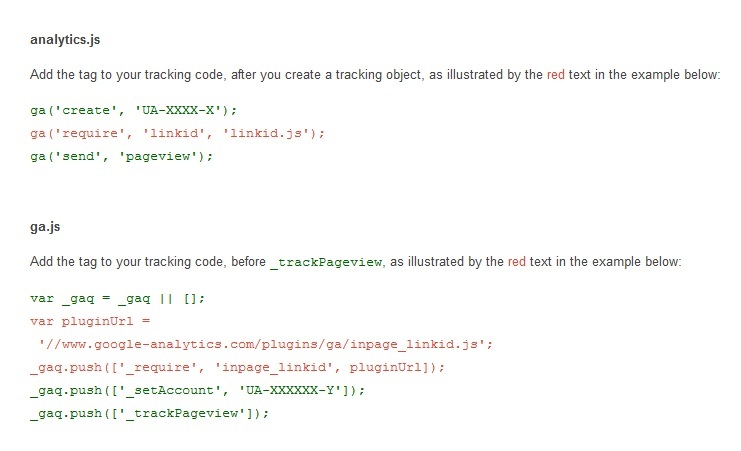 Enable Enhance Link Attribution in your profile by adding extra line of code within your default Analytics code. 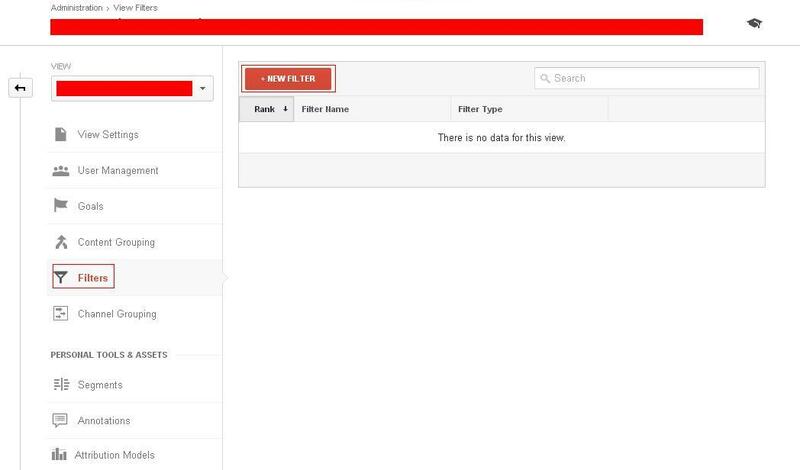 Setting up custom filter at profile level is extremely beneficial because it provides you a way to view chosen data (selected medium, country and many other potentials) in just a click. Remember before you go to create a profile filter for whatever reason always create a backup profile first so that you don’t lose your important data if setup inaccurately. Be careful with it as if filter is applied, you wont be able to recover your data. So it is highly recommended to create a backup profile first and then apply filter. By default GA tracks your own and every other visits from the same company or country. You can exclude those irrelevant sessions by applying a filter to block traffic coming from specific IP addresses used within your office or home. You can also use filters to include/exclude sessions of ISP domain, hostname or a sub-directory. There are plenty other custom filters in Google Analytics and do share your mostly used in comments below. 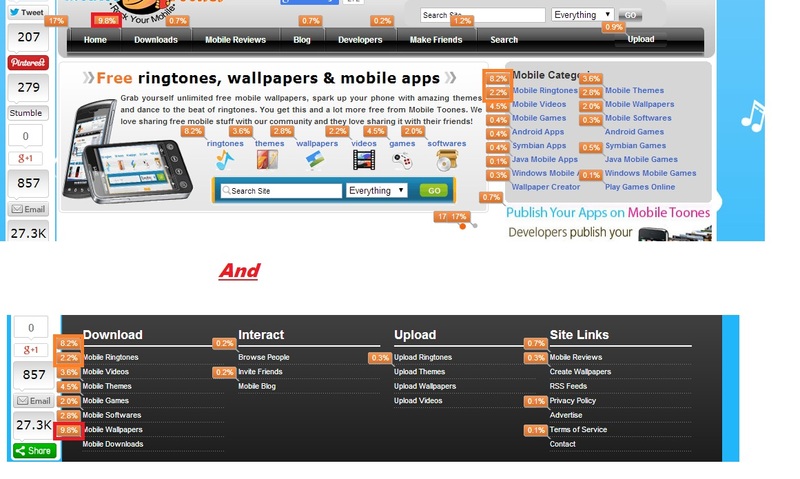 Many a users visit websites from different devices such as computers, laptops, tablets and smart phones. But the problem is Analytics considers those visits as fresh visits each time. This is the default report you see in Google Analytics but the problem with this report is that it does not differentiate how many of them are your returning visitors coming from a different device. This problem highly affects E-commerce or conversion data. You will only know the device which completes the conversion but what about the other devices a user has been through to complete a purchase. For example; John landed on your website for the first time on his home computer. He kept the company name in mind so while driving to office he started exploring it on his smartphone. He browsed different products and eventually decided to buy from your online store. Meanwhile, he reached office and completed the purchase process by using his office PC. Confused? Now in Google Analytics the conversion credit went to Johns office machine and It is shown as a new visitor who completed purchase in first visit. But in reality he went through 3 different devices to make a final purchase. 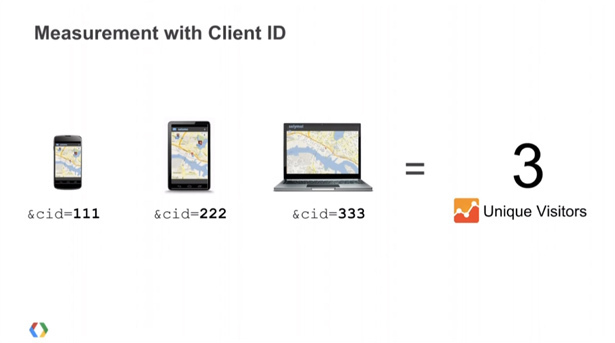 Google Analytics had no solution for this but in Universal Analytics you can track visitors across multiple devices. 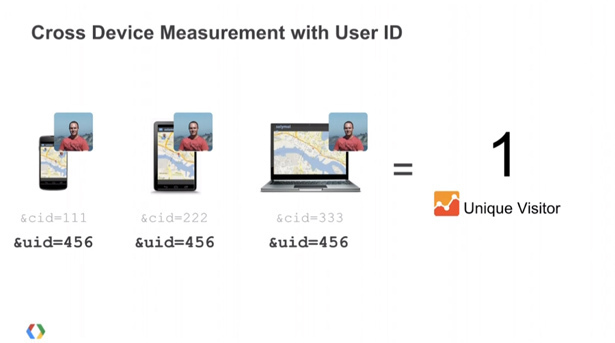 To start tracking, you have to enable User-ID feature in Analytics. Companies can use their CRM system or customer database to assign User-ID to its users. Websites usually have login systems; they can use their unique Login ID’s to assign User-ID. I believe it’s a bit difficult and requires programming knowledge or help of a developer. Below are some good resources on how to set up the User ID feature to track visitors across different devices. Almost every other E-commerce website has implemented E-commerce Tracking in Google Analytics. So if any of you don’t know how to set it up here is Google guide on how to get started. Duplicate transaction data in Google Analytics is a common problem that most of you face after setting up E-commerce tracking. We use ­­_addTrans () method to create a transaction object, _addItem () method to add items to the transaction and _trackTrans () to submit the transaction details to GA. After setting up make sure that you use _trackTrans () code to call once per transaction. If called twice, it is going to send data in Google Analytics twice which eventually causes duplicate transaction data in reports. Some websites use third party shopping carts and in that case you will have to implement cross domain tracking between your domain and the third party domain. When done, implement E-commerce tracking code on your receipt page. If you have a PayPal as a payment method in your shopping cart then the transactions done via PayPal are not tractable in Analytics. But you can track those transactions using the method below. Note that you will have to send a user back to your website after the transaction is completed. To do this go to your PayPal account and then under “My Account” click the Profile link. Now go to “Website Payment Preferences” under “My Selling Tools”, youll see the option of “Auto Return” turn this option ON and then enter the URL of your thank you page along with ?utm_nooverride=1 at the end of the URL. This is going to give a strong signal to GA not to override the previous source of the visitors. For example if a visitor lands on your website via Google search and completes the transaction through PayPal then conversion credit goes to Google (not PayPal). What they say Marketing without data is like driving with your eyes closed so you should surely go to fix things in order to get accurate data out of Google Analytics. Since Google Analytics is a trending tool so you cannot expect it to be 100% accurate. Right? I have highlighted some common issues in this post so feel free to post other common issues you come across in GA dashboard. Previous Previous post: Google is making SMBs Zoophobic: Which is the scariest Panda or Penguin Update?